At first glance, an Italian wine label may seem difficult to decipher, but once you learn the system, you will quickly be able to make an informed decision when you purchase your next bottle. The same system will also prove useful when ordering Italian wine from a menu. Italian wine labels do not always explicitly state the grape varieties used, so while it is helpful to have some background knowledge of the primary grapes grown in Italy’s 20 regions, it is not necessary. The wine name is always prominently listed, often at the top or in the center of the label. The name could refer to the region (such as Barolo), grape variety (such as Pinot Grigio), it could be a “fantasy name,” (such as Tignanello), or it could refer to a specific vineyard (such as Vigna Rionda). Fantasy names are created by the producer and may indicate that the wine is a blend or made outside the tight regulations applied to appellation wines. Sometimes the wine name encompasses both the grape variety and the location, such as Montepulciano d’Abruzzo, or in the example above, Dolcetto d’Alba. The classification level is arguably one of the most important elements to look for on the label. The categories are Vino da Tavola (VDT), Indicazione Geografica Tipica (IGT), Denominazione di Origine Controllata (DOC), and Denominazione di Origine Controllata e Garantita (DOCG).  The least regulated wine category in Italy is VDT, which literally translates to “table wine.” Wines labeled IGT are more regulated than VDT wine and must come from a specified region. IGT wines are allowed some freedom regarding production and grape varieties––often resulting in great wine. 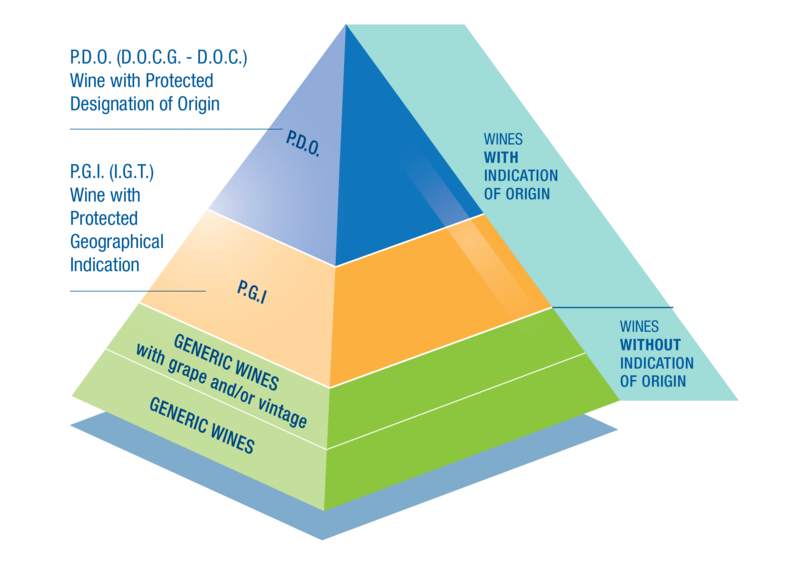 Wines bearing the DOC classification must adhere to standards established by the local regulatory board regarding cultivation area, grape varieties and production methods. DOCG wines are bound to even stricter standards for these categories and are thus considered the highest-quality level among Italian wines. If the region (or subregion) is not included in the wine name, it can generally be found above the classification level. For instance, you might see a region such as Puglia listed above the term Indicazione Geografica Tipica, or Chianti Classico above Denominazione di Origine Controllata e Garantita. The producer (or bottler) is often printed at the bottom of the label, and could be a single wine estate, a cooperative or a brand. Look for words such as “Tenuta” (estate), “Castello” (castle), “Azienda” (company), “Cantina” (winery), “Poggio” (hill), “Vigneto or Vigna” (vineyard), “Fattoria” (farm), and “Produttori” (producers) to help you identify the producer. If you are buying the wine in the U.S., you can generally find the importer’s information on the back of the label. 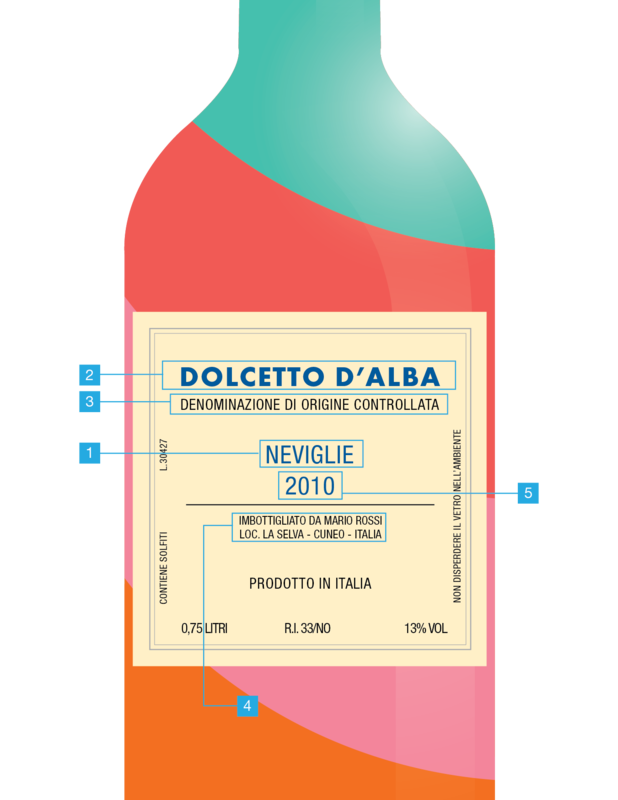 Wine menus in the U.S. generally contain the main elements you will find on an Italian wine label, with the exception of the classification. On most menus the information will generally be listed in the following order: Producer, Region, Wine Name, and Vintage, although many restaurants try to also include the grape variety.